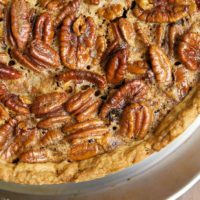 Long before I’d even considered starting this blog, I used to make this pie for the holidays when I wanted a break from traditional pecan pie. While at its heart, this is more traditional than not, this pie has a couple of interesting things going for it. First of all, it has a buttery, cream cheese-y crust. Secondly, for those of you who love that gooey filling of pecan pies, there’s more of it than usual in this beauty. Despite its somewhat daunting appearance, this is actually a simple pie to make. The only potentially tricky part is the crust. It can be a bit difficult to transfer the dough into the pan. Also, be sure not to skip the step of wrapping the pan in foil. It will help prevent a big mess. This beauty is an impressive addition to your holiday dessert offerings. Small slices work well and will make it go further than a regular 9-inch pie. And, I’m guessing you’ll be asked to make this one again and again. 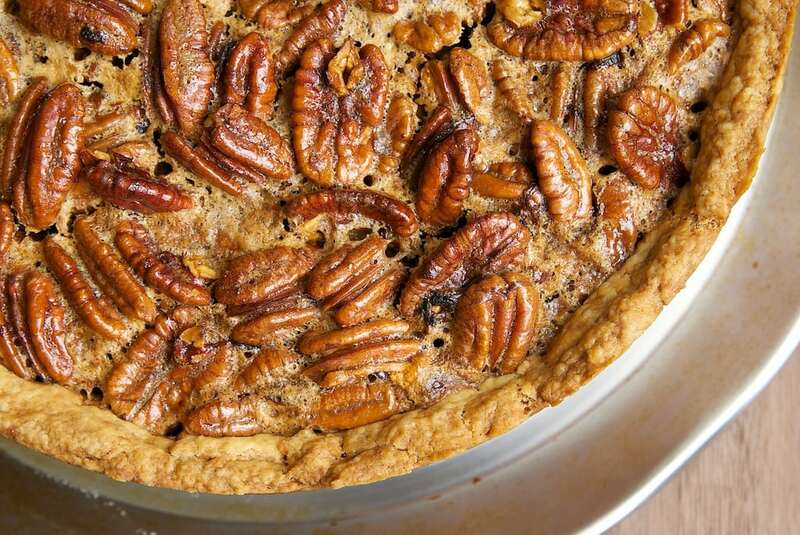 Deep Dish Pecan Pie is tall, beautiful, and delicious. 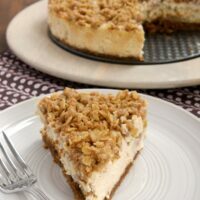 It has more than the usual amount of gooey pecan pie pie filling inside a cream cheese crust. Wrap the outside of a 9-inch springform pan in aluminum foil. Using an electric mixer on medium speed, beat the butter and cream cheese until light and fluffy. Gradually add the flour and sugar, and beat well. Shape the dough into a flat disc. Cover and chill 15 minutes. Roll the dough into a 13″ circle. Carefully transfer the dough to the prepared pan. Press the dough into the bottom and up the sides of pan. Cover and chill. Whisk together the corn syrup, brown sugar, and melted butter. Add the eggs, egg yolks, vanilla, and salt, and stir well. Stir in the pecans. Pour the filling into the crust. Bake for 15 minutes. Reduce oven temperature to 300°F. Bake 2 hours & 15 minutes or until set. If necessary, shield the pie with foil to prevent excess browning. Cool completely on a wire rack. Cover and chill. Remove the sides of the springform pan before serving. This looks incredible. For reasons completely unknown to me, my mother talked me out of making a pecan pie for Thanksgiving and I’ve been thinking about one ever since! My sister loves pecan pie. She prefers versions with a much higher ratio of nuts to gooey filling. I don’t see a slice of this so I am wondering where this pie falls out as far as nuts to filling? Hi, Anne. 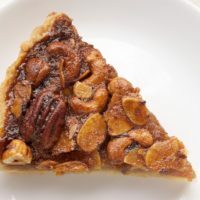 There’s just a single layer of pecans at the top, and the rest is all filling until you hit crust! I imagine I could try tinkering but come to think of it, to please my sister with a pecan pie of this magnitude I would need to rob a bank to pay for all the pecans she demands! You really meant deep dish when you said it! I love it! My dad loves you now because he’s been looking for a deep dish pie plate. Now we know a springform pan will work (which I have 3 of them!). This looks amazing. I think I have to start making pies more often. I am dying over this pie. It’s amazing! I have a question….why do you put the foil on the outside of the pan instead of the inside? Hi, Page. Putting the foil on the inside of a springform pan doesn’t work that well. Believe me, I’ve tried. Wrapping the outside prevents spills while still leaving a beautiful crust that is revealed when the sides of the pan are removed. It also leaves your pie on the base ready to serve, instead of sitting on foil. Oh my! This pie looks delicious! Hi, Marla. I think you could freeze the pie. Just be sure to wrap it very well. 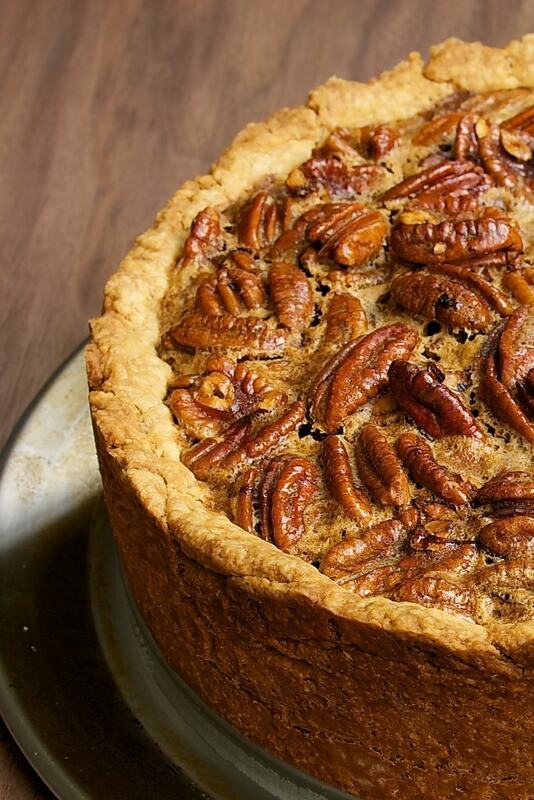 I made this deep dish pecan pie last week to make sure it would work for Thanksgiving. I sent it to my husbands work and it was a huge hit!!! I did have difficulty with the crust. When I folded it in half and tried to put it in the pan it just stretched out of shape, so I took it out patted it into a circle again then put it back in the fridge. After it chilled I rolled it out in a circle, cut it into 4 pieces and put each piece in the pan and just pressed the seams together, worked perfect. all the filling and the crust mixed in together and was more cake-like. Made this for Thanksgiving 2014. It was delicious and very impressive. 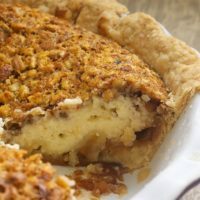 Only one thing – the bottom crust somehow rose slightly above some of the filling so I had pecans, filling, bottom crust, filling. I think next time I make it, I will either freeze or refrigerate the crust prior to adding the filling or pre-bake the crust for just about 10 minutes. Anyone else have this problem? I had the same problem with the crust rising and mixing into the filling when I made this pie last year. I’m going to make it again this year, and I will try your suggestion of freezing the pie crust just before adding the filling. Good idea. The pie was still AMAZING, and it was a huge hit! I want to make this and have made a number of cheese cakes in the past. 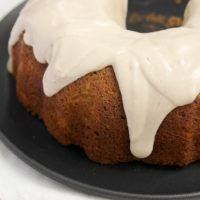 Is it okay with this recipe if I turn the oven off, crack the door of the oven, and let it sit in there for another hour? Or given the top layer of this pie it’ll be fine and not crack? Hi, Jon. There shouldn’t be a need to leave this pie in an unheated oven. I usually do that for cheesecakes, but not for pie. If you’re looking for a pecan pie – cheesecake hybrid, try this Pecan Pie Cheesecake. Thinking making this for Thanksgiving. Do you think I can add melted chocolate? If so, how much? Hi, Suzanne. I’ve not tried that, but I think I’d recommend chocolate chips versus melted chocolate. Those wouldn’t affect the consistency of the filling as much. Maybe a cup of chocolate chips? Hi Jennifer, I see you are using the same recipe that was published in Southern Living Magazine many years ago. I’ve made this pie over and over and it’s always is a hit. I think it would be nice if you gave credit to the creator of this delicious pie. Hi, Georgia. Yes, this pie is the best! And it is indeed from Southern Living, which is attributed in the recipe. Hi Jennifer, I’m a non baking man that has a few questions. 1. What’s a prepared pan? 2. After I press the dough into the pan, how long should I chill it? 3. A couple people commented on the bottom dough rising and mixing with filling. What might have caused this? I only have one shot at this, so I want to get it right. Thanks. Hi, Tony. “Prepared pan” refers to how you prepped the pan in the first step of the crust instructions. I’d chill the dough at least half an hour. An hour or even two would be better. You could also freeze it for 15 or 20 minutes. I think that’s likely the problem with the crust rising into the filling. Hi Jennifer! I made this for Thanksgiving and it was a huge hit. I took the advice I saw in some earlier posts about freezing the crust until hard (about 20 minutes in a deep freezer) before assembling and baking, yet I still wound up with a portion of the bottom crust lifting up. I’m making it again for Christmas and I think I’m going to briefly blind bake the crust first. Otherwise an AWESOME recipe. Thanks! Hi, Jessica! I’m glad you liked the pie! I’m sorry you had troubles with the crust. Blind baking would likely fix that issue if freezing didn’t. How long would you blind bake it and on what temp? Hi, Tony. I’ve not tried blind baking this particular crust, but I’d try 325°F for about 20 minutes. When you bake the fully assembled pie, you may need to shield the top of the crust with aluminum foil so that part doesn’t overbake. Thanks. 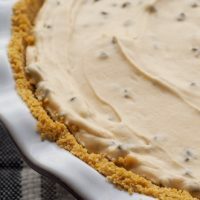 Would I need to let the crust cool before I add the filling and bake the pie? Yes, I’d let it cool completely. I would really like to make this for Thanksgiving. Other than bread, I am not much of a baker. I don’t think I’ve ever seen a pie crust recipe that did not call for ice water. I’ve read that water and fat help to create a flaky crust. This crust seems to be particularly strong, but does it’s strength and the absence of water make it more leathery? Hi! I’ve made this pie many times exactly as it’s written, and I’ve never had any issues with the texture of the crust. It’s a bit sturdier to hold up to all of that pie, but it still has a nice texture. Have you thought about making a Youtube video of you making the pie so everyone can see your technique? Are you supposed to dock the pie crust before baking? I’m wondering if that’s why the crust rose into the filling. You can if you like. When I blind bake crusts, I usually line the crust with parchment paper and use pie weights. Of course, I’ve not tried blind baking this particular crust, so I can’t say for certain what would be the best way in this case. Can you make this ahead of time and freeze and reheat? If so what would be the method? I’ve never frozen this pie, Ashley. If I did try to freeze it, I would just try the usual recommendations to wrap extremely well and thaw overnight in the refrigerator. Then you should be able to bring it to room temperature after that. I will try it! Thank you!! I’ve made this pie a few times. The first time it was perfect. The last two times, the center did not congeal! I have one in the oven right now. I followed the instructions to a T. The center still seems jiggly. I’m leaving it in the oven for another while with a piece of foil resting on top of it. Any ideas why the center has given me troubles? I am an experienced baker, and this just makes me crazy. I,not giving up! We love this pie. Hi, Carol. Are you using a different pan by any chance? If you’ve not changed anything at all, then you might check the accuracy of your oven’s temperature with an oven thermometer. I added two cups of cranberries and 1 1/2 pecans the tart cranberries cuts the sweet a little. Awesome. Hi, CJ. Your pie may have needed a bit more baking time. Look at the last of the directions for chilling information. Should I toast the pecans first? Hi, Judith. No, you don’t need to toast the pecans. They’ll toast some as the pie bakes.